Michelin 1-star JV by Alain Ducasse is a tribute to science fiction writer Jules Verne and is situated on the second level of Eiffel Tower. 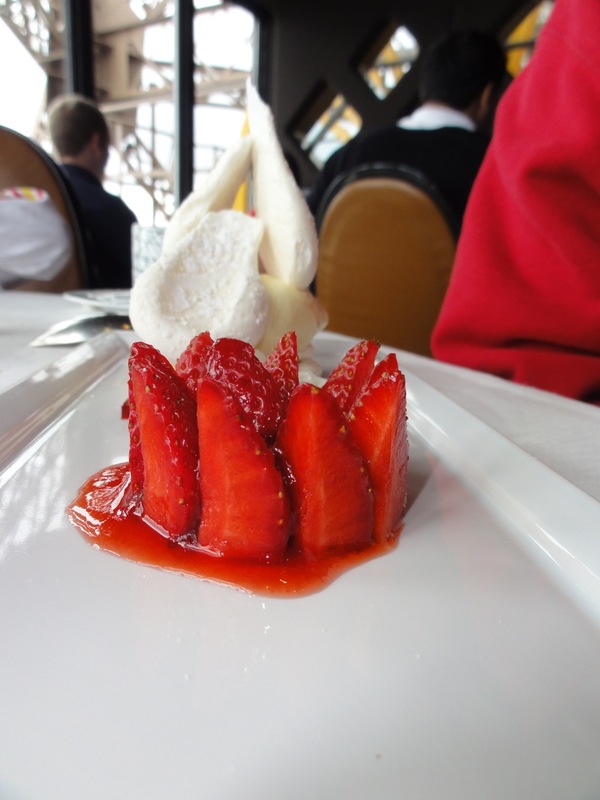 This is a fantastic intro to French fine dining without burning your pocket and get to travel to the second level of Eiffel Tower at the same time. For the price of a good lunch, you get to do both. 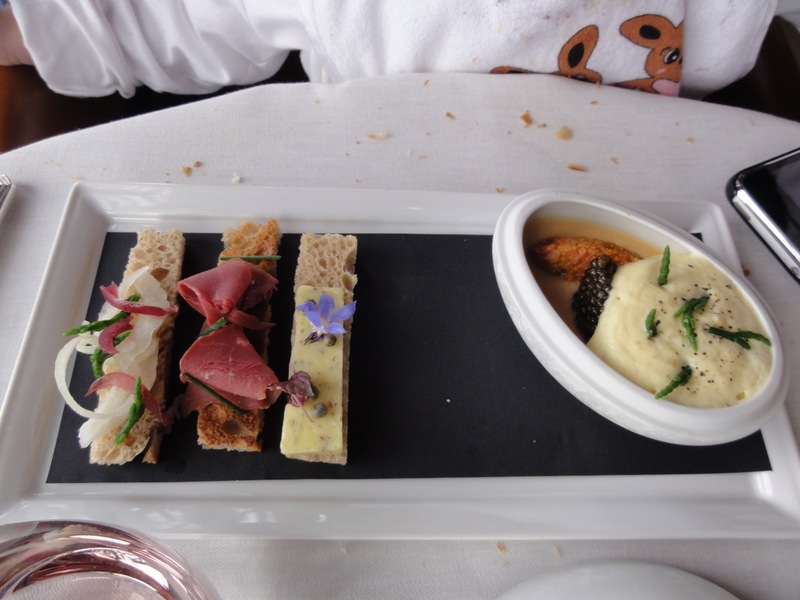 The best value I reckoned was to order a set lunch for 85 €++ and then some a la carte for the party of 3. The set lunch menu came with 3 choices of appetizers, 3 choices of mains and 3 choices of desserts, many of which came from the a la carte menu. Therefore it was really value-for-money. 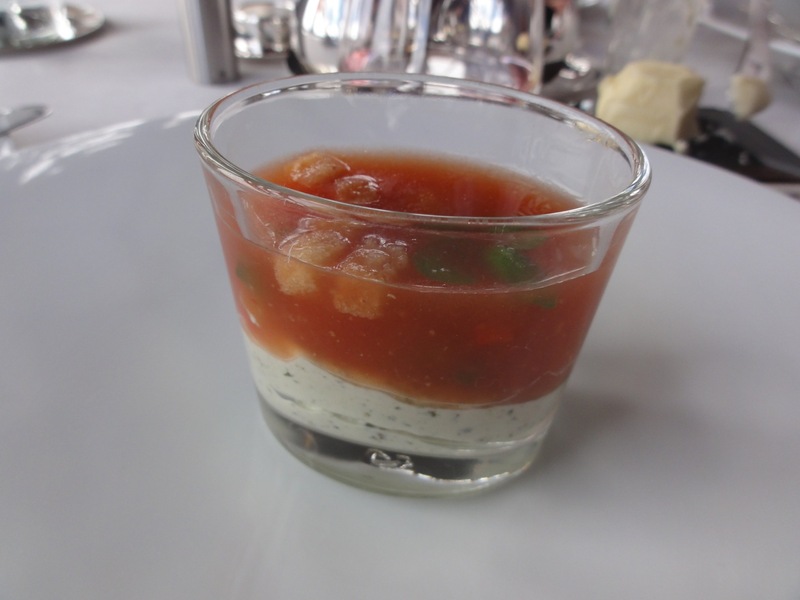 The meal started with a complimentary “Mouth-Teaser” – a cool tomato shooter with panacotta cheese. 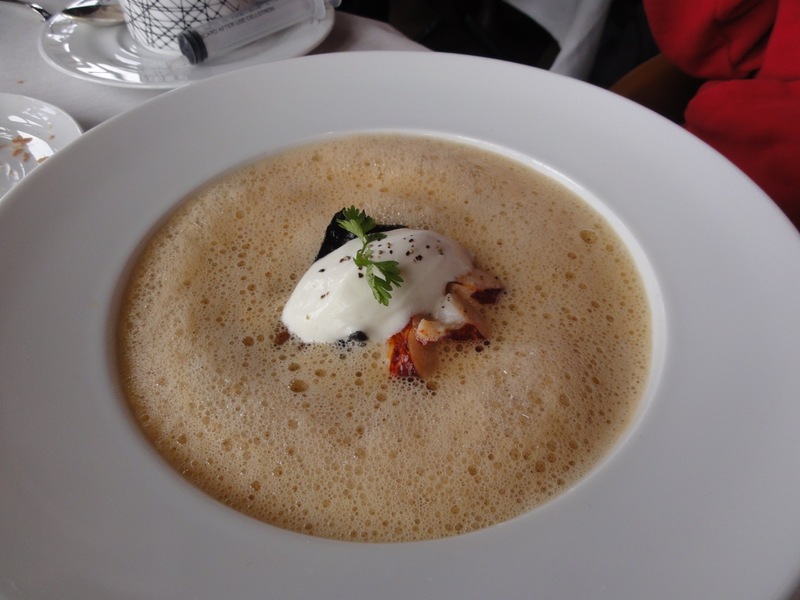 The cold starter was good relief from the heat outside (it was summer in Paris) and kick-start our appetite for more. 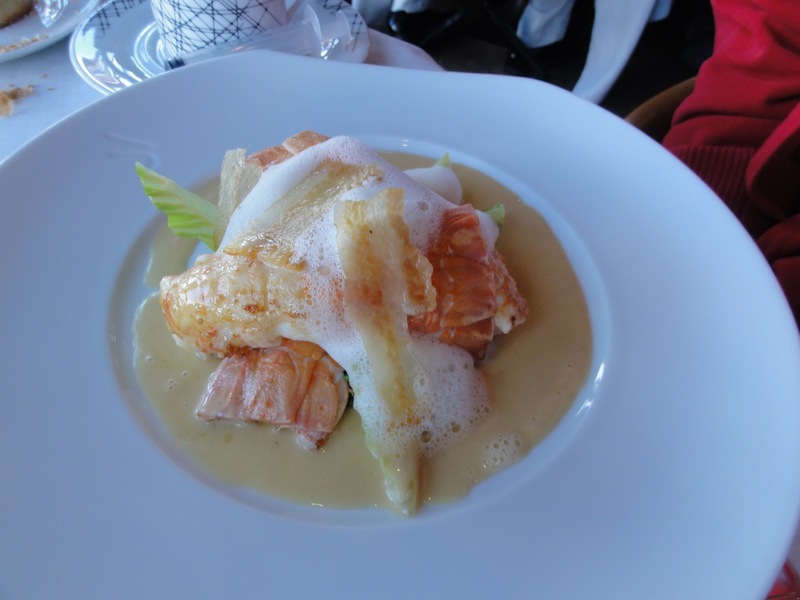 The first of the 3 a la carte appetizers we ordered was the French lobster in a jellied sauce that was used to glazed the lobster, with crisp romaine lettuce and baby spinach as base and sauteed chanterelle mushrooms to top it off. The sauce was creamy and light and went well with the lobsters. It was a generous serving of 3 pieces of lobster tails (although French lobsters are really small). The mushroom tasted like our 杏鲍菇. 86 €. The next appetizer I considered the best of the 4 we had. It was almost like Chawanmushi but the soft-boiled egg was not exactly steamed. But when combined with the caviar and sea urchin (both still raw), it became heavenly. Came with 3 pieces of toasts with edible flowers and some salami. Fantastic and worth every bit of 68 €! This is a classic dish in French cuisine, and I don’t understand why California is banning it. 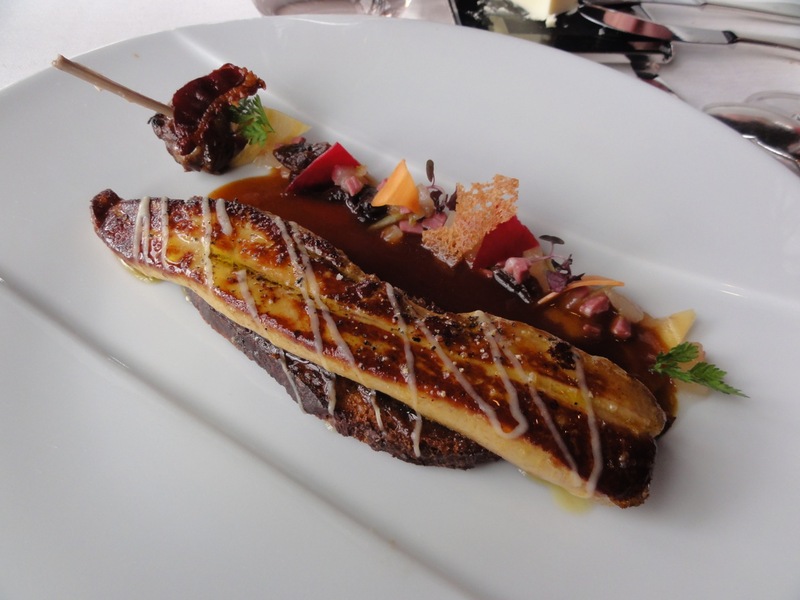 Foie Gras can be made with duck, and it is still as tasty. As proven by this appetizer, the foie gras was seared to perfection on a piece of toasted bread and plum sauce, with a tangy dripping of apple vinegar (?) and beef redux to complete the dish. Textbook perfection for foie gras, and at 62 €, this was not cheap. This soup came with the set lunch and tasted like a lobster bisque. But it was must lighter yet packed the same punch as a bisque. For some reason since El Bulli used foam in their food had the culinary world followed in earnest. This was a herb flavoured foam but I don’t think it added any flavour to the over-powering shellfish soup based. The first main was a roasted duckling that came with the set. 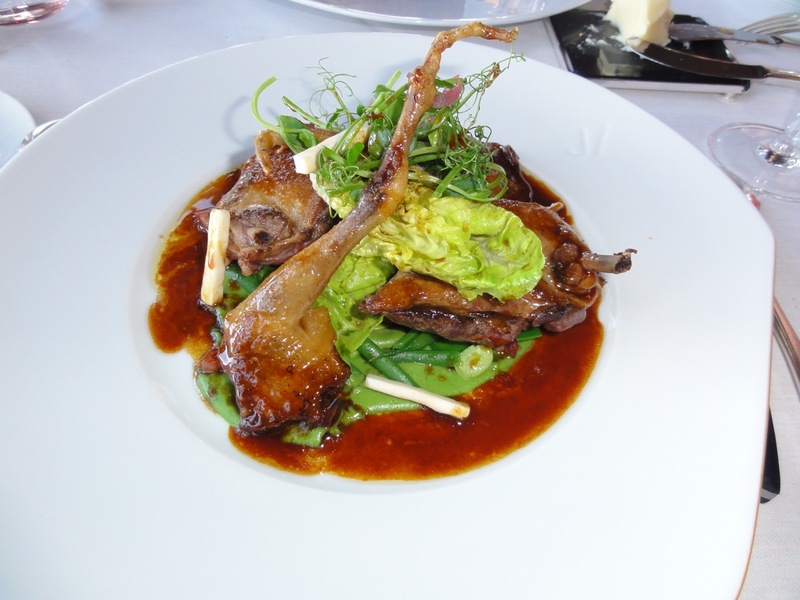 This was a well-seasoned duck, sorry duckling, quite gamey and had little meat. But the flavour was rich and the bean and pea mash added the country feel to this simple dish. Well executed, the simpler the dish the harder to get it right, JV had nailed this one. Lamb chops can be gamey, but this one was perfect. Served with another piece of shoulder lamb, it made us wonder why the no one else thought of that at other restaurants in the world. 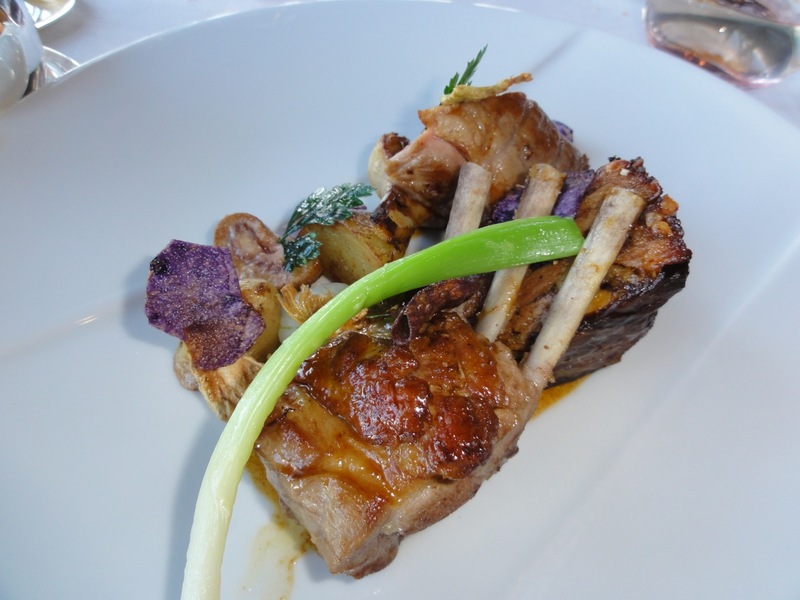 Lamb chops tend to be quite small, and therefore could not really make it as a main technically. But JV gave you another piece of lamb to make up the volume. Great dish. 78 €. 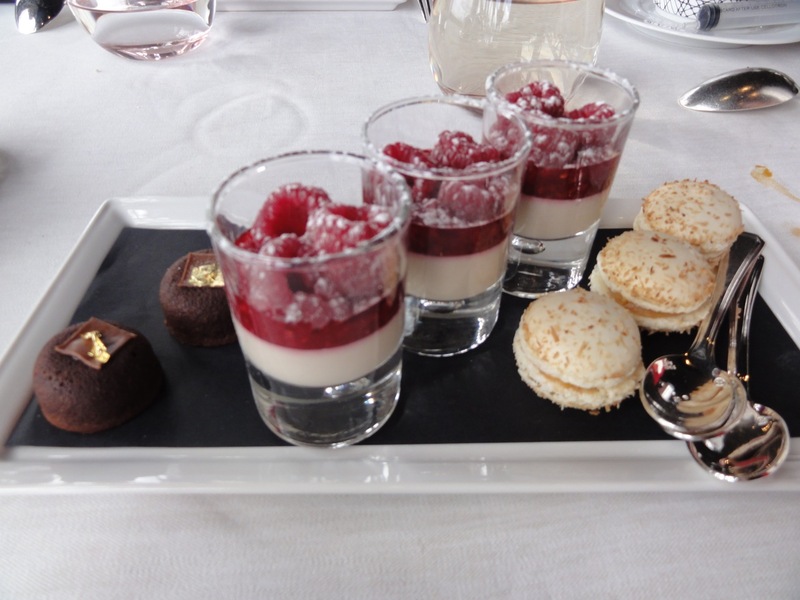 And to end the lunch, our coffee came with macaroons, raspberry mousse and dark chocolate truffles. And before we left, we were given bread for breakfast the next day (which we finished during our tea break). Price: Bargain for set lunches, Michelin-prices for the rest. Service: Attentive but not intrusive. Ambiance: Romance Capital of the world, 2nd level of Eiffel Tower, what more can you ask for. Remember to call in advance to get window seats in the middle section. Food: Well-deserved star. I wonder why only 1. In my opinion it deserved another.